I have been wanting to try this bread recipe for awhile after I first saw it on Sarah’s blog, My New Roots, back in February. Months later, I finally got around to it, and I’m so glad I did. 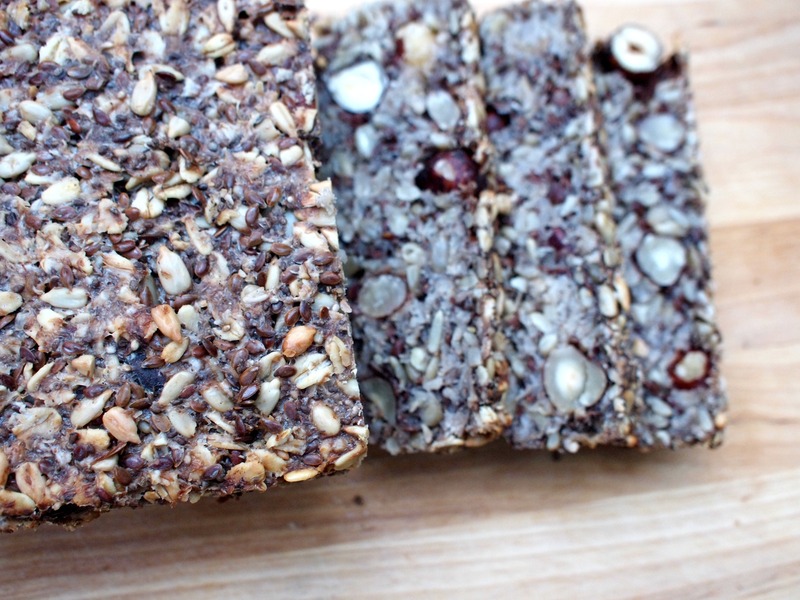 This bread is different than traditional breads–it doesn’t include yeast or flour, instead it is dense, and full of nuts, seeds, and chewy oats. 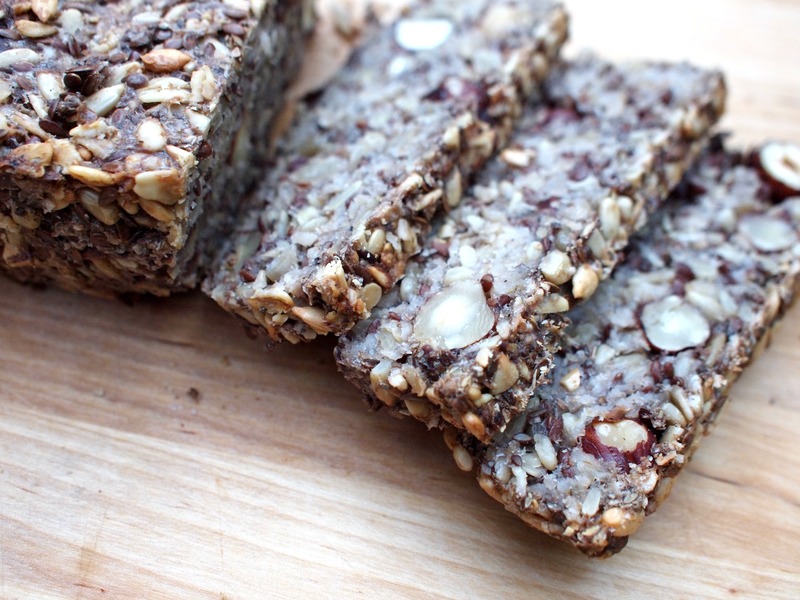 Psyllium seed husks are the ‘glue’ that binds this bread together. These little husks are also a great source of soluble fiber, which expands when ingested, helping to ‘scrub’ the intestines and aiding in the transport of waste and toxins through the intestinal tract. Yay! We had friends over for dinner the other night, and one affectionately called this ‘bird seed bread’, and proceeded to ask for another piece. It may look different than traditional bread, but trust me, it’s delicious! Full of fiber and protein, this bread keeps you satisfied for hours and would make a lovely breakfast, topped with smashed avocado, a little squeeze of lemon, sprinkle of salt and red pepper flakes or on the side of a steamy bowl of soup with a smudge of butter or as a post workout snack with nut butter or jam–the options are endless. I think this bread will become a staple in our house, and I hope the same for you. In a flexible, silicon loaf pan combine all dry ingredients. Whisk maple syrup, oil and water together in a measuring cup. Add this to the dry ingredients and mix very well until everything is completely soaked and dough becomes very thick, but not too thick to stir. If the dough is too thick, add a bit of water. Smooth out the top with the back of a spoon. Let sit out on the counter for at least 2 hours, or all day or overnight. To ensure the dough is ready, it should retain its shape even when you pull the sides of the loaf pan away from it it. Place loaf pan on the middle rack of a 350°F oven, and bake for 20 minutes. Remove bread from loaf pan, place it upside down directly on the rack and bake for another 30-40 minutes. Bread is done when it sounds hollow when tapped. Let cool completely before slicing. Store bread in a tightly sealed container for up to five days. It freezes well too (slice before freezing for quick and easy toast)! *Note: If you don’t have a silicon loaf pan, a regular bread pan will do, however, I recommend combining the ingredients in a bowl rather than the bread pan, and coating the pan with some coconut oil or lining with parchment paper (which makes for easy lifting of the bread) before pouring in the dough. Then resume the recipe as normal. This entry was posted in breakfast, food, side dish and tagged fiber, gluten free, protein, vegan, vegetarian on October 8, 2013 by Ashley Couse. What smart friends you have. Can I have some more please? thank you! your blog is lovely, as well. i love my new root’s blog and i’m glad it inspired both of our posts yesterday! Wow, this is one intense loaf. I bet it would be amazing with some Scandinavian smorgasbord! yum, that’s such a great idea! it is definitely a hearty loaf!